It is in the can... ...it is on the back-up disc... A photograph is a brief moment of time that has been captured and secured for eternity within the confines of a defined two dimensional image... The images here will eventually span some 40 odd, and some would say very odd, years of my photographic work and providing I can be self disciplined will also portray regular current images and work in progress. This is a scan from a medium format fujichrome transparency. 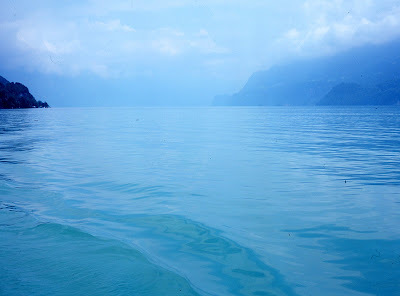 Spring in Switzerland a few years ago when the water took on a variety of different colours from this to a milky green. My father, brother & I enjoyed a meal in a fish restaurant overlooking the lake and I nipped out to make this image when the light briefly changed. Time, Water, hills and sky provide an ever changing set of images whether in the UK Lake District, a Med beach or in Switzerland and no one can ever say they have captured everything these places have to offer... I read someone saying that they went to a national park made famous by AA and found that he had been everywhere and taken all the images... all I can say is did AA photograph absolutely everything from every angle under every lighting condition ~ I doubt it. All images on this blog are © Martin Hulbert and are not to be used or copied without my prior permission. You may however make a link to my blog entries from your blog / website.